The Corner Brook Public Building was designed by J. Melville Miller of Montreal, and plans for the construction go back to July 1925. William I. Bishop Ltd. was chosen as the contractor. The building was to be constructed at a cost not exceeding $60,000, plus a contractors fee of $5,500, with the building to be ready for service on January 1, 1926. 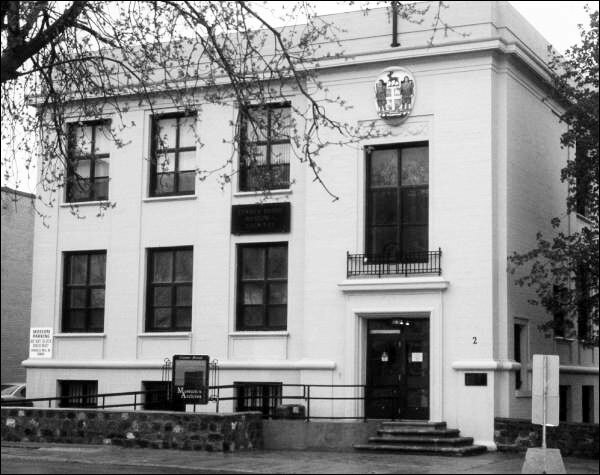 The Corner Brook Public Building is a fine example of neo-classical, 1920s architecture. Things did not go smoothly. There was great debate over the proposed site of the building. Five locations were proposed and it took several months to select one. On October 21, 1925, local newspapers reported that work on the public building had begun. Excavation for the foundation had been completed, and the forms had been put in place for the basement walls. However, in a letter from J.R. Bennett, Colonial Secretary, dated December 7, 1925, it seems that the exact plot of land that was to be used was still in dispute! The second problem was the cost of the construction. Unexpected costs arose which took time to sort out, and it soon became obvious that the building would not open as planned. By mid-February 1926, finishing touches were being made. The total cost of the building came to $72,034.81, well over the contracted price. As a result of this, combined with the late date, William I. Bishop Ltd. lost the contractor's fee. The courtroom opened on March 2, 1926, with Magistrate Vatcher attending from Curling. But the building was not inspected by the Superintendent of Public Works until March 25, and even then an additional $2550 and three or four weeks of work were needed to ready the building for occupancy. The post office finally opened by April 21st and the customs office the Monday following. The building is a concrete structure with poured concrete exterior walls, floors, and columns. It was designed to include a post office on the main floor, the customs office on the lower floor, and the court house on the top floor. The exterior finish is painted concrete, and the interior finish is plaster with ornamental mouldings and pilasters. There is a marble stairway, and originally there were to be other marble features, such as black Missisisquoi marble door thresholds. Over the years, the Public Building had many other uses. It was subsequently owned by Bowaters, the government, the Railway and Newtel Communications. Newtel conveyed the property to the City of Corner Brook on November 19th, 1995. The building was also used for the jail scene in Gordon Pinsent's film, The Rowdyman (1972). In 1997 the City signed a stewardship agreement with the Corner Brook Museum to house the city's first museum. The Society received funding from HRDC for restoration work, as well as support from Newtel, the City of Corner Brook, ACOA, and the Downtown Business Association. Vacant for several years, the building was starting to deteriorate. The work included exterior and interior restoration and upgrading of services and amenities to meet present-day building code requirements. Original plaster mouldings were restored, as well as the marble staircase and the coat of arms over the front entrance. The Corner Brook Public Building received the 2000 Southcott Award for restoration by the Newfoundland Historic Trust. It was designated as a Registered Heritage Structure by the Heritage Foundation of Newfoundland and Labrador on September 15th, 2001. Also view the Corner Brook Public Building Registered Heritage Structure on the Heritage Foundation of Newfoundland and Labrador web site. The Newfoundland and Labrador Heritage Web Site has on its site only a portion of the registered heritage structures in Newfoundland and Labrador. To view a complete list or search for a particular structure visit the Heritage Foundation's Property Search page.